What Are the Parts of a Japanese Futon? How Do You Take Care of a Japanese Futon? Where Can You Buy a Japanese Futon? Is a Japanese futon really all that different from the futon we know in the West? Well, yes. The most important thing to know about the Japanese futon is that it is different from what we think of as a futon in the US. It is not the space-saving sofa bed popular with college students, although it is likewise flexible. The name of this Asian bedding set is something of a long-running misnomer. Futon (布団) is actually a Japanese loanword—similar to words such as emoji (絵文字) or tsunami (津波). Why, then, do we define the futon differently from the Japanese? Simple: The English-speaking world doesn’t always appropriate words and keep their original meanings. The word futon came to mean something different outside of Japan over the years—so much so that we now have to use a qualifier. This is why we have the term Japanese futon to denote the traditional kind. Many think of the Japanese futon as an Asian version of a portable indoor sleeping bag, but it is actually a set of items that make up a ground-based sleeping setup. While just a few items are truly essential to a very basic Japanese futon setup, accessories are often stored and used with it. Moreover, these add-ons can be considered as part of the Japanese futon. It’s similar to how we think of our beds as being not just a mattress and box spring—but also inclusive of blankets, comforters, pillows and more. Two parts are a must: a shikibuton (敷き布団) and a kakebuton (掛け布団). They are sometimes accompanied by a makura (枕), a mofu (毛布), and occasionally a taoruketto (タオルケット). More traditional setups also require tatami(畳) flooring, or at least one tatami mat, to place between the floor and the Japanese futon. Let’s go through the different parts of the Asian bedding set below. The main component is the mattress: the shikibuton. It’s about three to four inches thick; and the same dimensions as one tatami mat, at 5.9 feet long and half as wide. Historically it was stuffed with 100% cotton, but contemporary models available today use a variety of materials; such as wool, latex, foam, and other synthetic materials. On top of the shikibuton is the kakebuton: a comforter or duvet of varying thickness and make. A kakebuton is a little larger in size than the shikibuton, and laid on top its edges usually spill over the side. It can be machine- or hand-quilted; and made of fabrics ranging from the most cost-efficient cotton and polyester, to more expensive options such as silk. The former tends to be heavier and more prone to dust mites, while the latter is naturally hypoallergenic and more able to regulate temperature through the seasons. Like a duvet, the kakebuton is often protected by a cover that is easily and regularly washed; these covers are usually simple compared to the kakebuton, which can still be seen through a popular “open window” design that faces outward. You can use any kind of pillow with a Japanese futon—after all, it is your bedroom setup, and you can alter it as you see fit. But if you want a complete cultural experience, then a traditional makura should be part of your bedding. A makura is smaller and firmer than a typical pillow, and authentic models are packed with buckwheat hulls. However, many commercially available makura sold as part of Japanese futon sets now contain foam or other synthetic fillers. As an aside, even if you are not thinking of getting a Japanese futon, consider the makura! Buckwheat hull pillows are actually recommended for people with allergies, neck pain and tension—as they’re organic, hypoallergenic, easy to shape and provide great support—although they can be noisy if you’re not used to them. The mofu (毛布) and the taoruketto (タオルケット) are simply Japanese blankets. The mofu is for cold weather and is typically made of wool, while the taoruketto is for hot weather and looks and feels like a large beach towel. Tatami flooring is composed of tatami mats arranged and laid out on the floor. The firm yet cushioned tatami is made of rush grass and rice straw, and was commonly found in Japanese homes for centuries. These days, Japanese homes are not automatically expected to have tatami flooring. Still, many maintain at least one washitsu (和室)—a traditional Japanese-style room—or have tatami mats specifically to use in between the ground and their Japanese futons. Tatami provides additional padding and protection to the Japanese futon, is similarly flexible and easy to roll up and put away, and adds authenticity to the bedding set. However, worth noting here that a tatami is completely optional, and that most Japanese futon sets available online will not have this bundled in. You will have to purchase it separately. A Japanese futon should ideally be folded up and stored in an oshiire (押入) or a deep closet during the day. To further preserve the quality and lengthen the lifespan of a Japanese futon, it also must be aired out, preferably under direct sunlight, on a regular basis. Keeping a Japanese futon hidden away while you’re not using it prevents molding and the accumulation of dirt. It is also normal in Japan to see people beat their futons with a special stick made of bamboo before airing them out, to aid in shaking off dust and other particles. A popular but non-traditional measure you can take is to place a sleeping bag or tri-fold mattress under the shikibuton. This updated take on a Japanese futon setup adds layers between you and the floor—making for a softer feel and a better chance of avoiding dirt or dust. Why Use a Japanese Futon? Japanese futons are excellent for living areas with limited space or a minimalist theme. They are also good to keep on hand as guest beds, although some may find them uncomfortable without extra padding. To fix that problem, you can layer shikibuton on top of each other until you reach the desired feel or opt for the modern solution already mentioned above—a tri-fold mattress underneath. Occasionally you will see something of a compromise: a Japanese futon on top of a tatami or mattress placed on a low platform bed. This offers the best of both worlds for some. 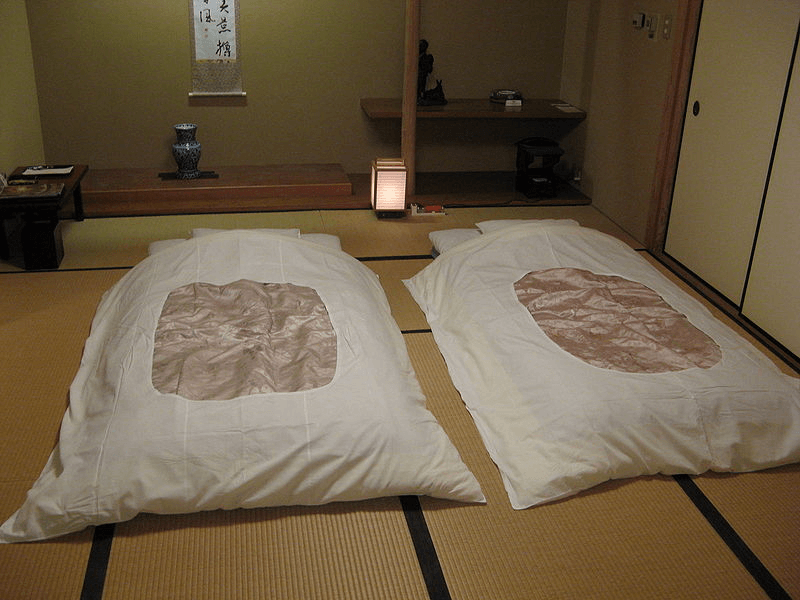 Nothing beats going to Japan and looking for the perfect traditional Japanese futon set there. However, if you’re okay with more mainstream and less traditional choices, there are many online options to choose from. Below are some of our favorites. Best Deal: EMOOR 8-Piece All-in-One Japanese Futon Set (Check deal on Amazon). Though not budget-friendly at over $250, this is a complete package. It comes with shikibuton, kakebuton and modern makura; as well as the covers for all three. It also includes modern versions of both blankets: mofu and taoruketto. Save: D&D Futon Furniture Traditional Japanese Futon Mattress (Check deal on Amazon). This is definitely more affordable at less than $100, but we wouldn’t consider it a great value package—it’s not a set at all, but just a shikibuton. This all-polyester product comes with sewn on strings that make the futon very portable and easy to roll up and store or transport. Splurge: J-Life Japanese Traditional 4″ Shiki Futon (Check deal on Amazon). This shikibuton-only purchase costs almost the same as our Best Deal pick! Very expensive, but it is also as close to a traditional Japanese shikibuton as you can get online. No foam, no wool, and with a five-year warranty, too.